If you’re anything like me, you probably have no idea how often you default to complaining. Complaining about yourself. Your job. Your family. The weather. The slowness of your weight loss. The unfairness of not eating whatever you want, whenever you want. I’ll bet you complain about more things than you’re aware of. You don’t mean it in a serious way, at least some of the time. But, it’s become a habit. And this habit is hurting you, even though you don’t realize it. Complaining draws your attention and all your mental resources toward what’s wrong instead of what’s right. Toward what you don’t want, rather than what you wish for. It creates negative moods for you, and, isn’t so pleasant for the people around you. Physically, it can have profound effects on your body and your brain when done on a regular basis. 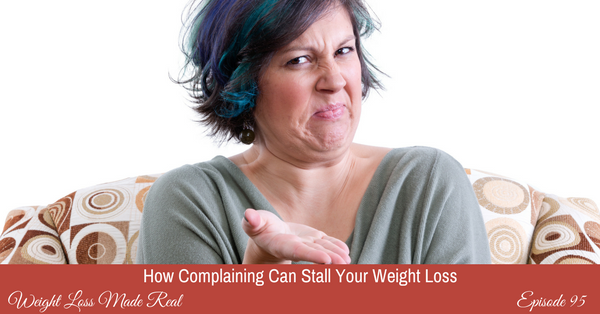 And, it can stall your efforts to lose weight. I’ll explain how inside this coaching session. So join me, and let’s shine the light on a seemingly innocent habit that could be holding you back. Episode 73: Why I Don’t Believe Your Weight Loss Excuses, and Why You Shouldn’t Either! Episode 70: Why Do I Keep Saying “Screw It!”? This entry was posted on Tuesday, October 24th, 2017 at 6:11 am	and is filed under Podcast. You can follow any responses to this entry through the RSS 2.0 feed. Both comments and pings are currently closed.